Stephen King’s most recent book, 11/22/63, is a time-travel adventure about a man from 2011 who uses a time “bubble” to attempt to prevent the Kennedy assassination. Writing a book like this is a bold move on the part of Mr. King. In the science fiction realm, time-travel stories are rampant and can easily become cliched and overdone. Furthermore, the Kennedy assassination is a kind of Grand Central Station for time travelers in fiction. It has been done in stories, books and television. So combining the two yet again was something of a risk. 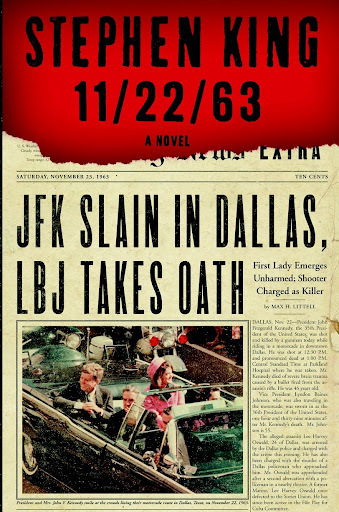 But after reading 11/22/63 it was a risk that I am grateful that Stephen King decided to take. The book is an outstanding example of what can be achieved when two over-used story lines are looked at with fresh eyes and a fresh approach. I loved the book from start to finish and most of the time had difficulty putting it down. The story is told from the point of view of Jake Epping. Jake is a teacher in Maine. His friend, Al Templeton, who runs the local burger joint, lets him in on a little secret. In the back of the burger joint is a portal into 1958. It is a little hard for Jake to accept until he tries the portal for himself. Al has been back to try to prevent the Kennedy assassination, but is sick with cancer and passes the torch to Jake. Before Jake can try to prevent the Kennedy assassination, he first needs to prove to himself that the past can be changed and affect the future. This little side quest takes Jake on an edge-of-your-seat thrill ride through familiar territory: Derry, Maine, in 1958. After his hard fought success, he returns to 2011 and decides to take on the mission to prevent the Kennedy assassination. This means living in the past for 5 years. And meeting someone special and falling in love. I won’t give away the ending but it is equally as thrilling as the rest of the book. Rather than use tried and true tropes of time-travel stories, King takes what seems to me to be a unique approach: each time you go through the portal, everything is reset back to the same day in 1958. This adds an important plot complication. Anything you’ve done to change the past is undone once you return through the portal to 1958. It means that if something goes wrong along the way, say, several years into Epping’s efforts, he can just go back directly to the point where things went wrong, but he has to start over from the beginning, much like a video game. Jake Epping’s character is well-developed, like all Stephen King characters and the story is told from his point of view and in his voice, which becomes familiar and comforting. And there is a wonderful surprise for long-time Stephen King readers: some familiar settings, some familiar background stories, and even some familiar faces during the time Jake Epping spends in Derry, Maine. The Kennedy assassination thread is also very well handled. King mentions possibly conspiracy theories, but proceeds under the assumption that it was a lone gunman and that helps to move the story along and avoid getting bogged down that has been rehashed in plenty of other books and movies. This is not a book about the Kennedy assassination. It is much more about the effect people have on the world around them–and each other. Most of all, this was a fun book to read, an edge-of-your-seat thriller with just the right amount of mystery, mystique, adventure, romance, and humor thrown in for good measure. Yes, humor. The funniest scene I’ve ever read is contained within these pages. Don’t worry: you’ll know it when you see it. This read is well-deserving of 5-stars. The funniest scene I’ve ever read is contained within these pages. Don’t worry: you’ll know it when you see it. That’s high praise indeed, to name one scene is the funniest you’ve ever read. I was in bed while reading the scene. Both my wife and my 2-year old son were laughing, too, because all of the sudden I’d burst out in uncontrollable laughter. I finished 11/22/63 Friday night and I haven’t a clue to what is that funny scene you two are chortling about. Please give me a hint. Chapter 8, section 7: When Jake/George visits the pharmacy in Derry. I couldn’t stop laughing throught that scene. Poor Jake! This is probably a dumb question but being that this is the first Stephen King book I had ever (EVER) read I was wondering what the date/place reference was on page 842? Dave, are you talking about the “January 2, 2009 – December 18, 2010 Sarasota, Florida, Lovell, Maine” reference? That’s just the time and places that that King wrote the book. Dave Molica–Nott a dumb question…I have read Stephen King before, but had no idea what that meant at the end either. I was very confused as I thought it was a reference to time travel again.